KNOCK IT OFF | Pro Chem, Inc. 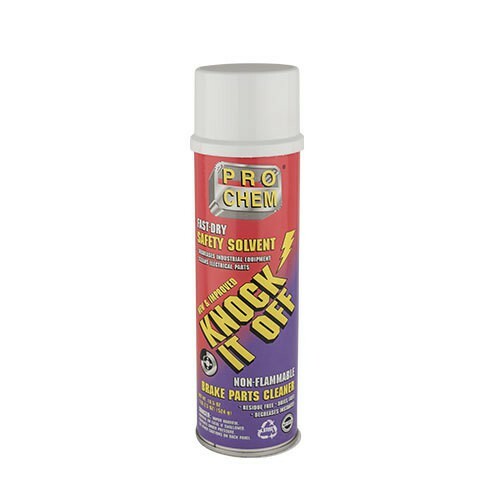 KNOCK IT OFF is a fast drying aerosol safety solvent cleaner and degreaser for use on electrical and industrial equipment and brake parts. It cleans metal, ceramic and baked enamel surfaces. KNOCK IT OFF removes grease, grime, oil and tar from most electrical parts and industrial equipment. Extends the life of brake components and improves brake performance. Remove or protect any rubber parts from overspray. Generously spray all other brake surfaces and allow powerful flushing action to rinse away contaminants. Permit surfaces to air dry or wipe dry with a soft, clean cloth. Extremely soiled assemblies may require repeat application or agitation. Do not spray on warm or hot surfaces. Do not use on plastic or painted surfaces.